Let’s start with that gorgeous cover, isn’t it stunning?! I’ve not read the authors previous book and based on the blurb I was expecting it to be on the lighthearted side, basic women’s fiction with a cutesy plot. Instead this was SO much more, it definitely has its fun moments and happiness but at its core it’s much deeper and full of substance. It tackles some extremely relevant and timely current issues in a really respectful and realistic manner. It touches on love, loss, community, and quite a bit more. This is told from two points of view, cousins Addie and Sam and it switches back and forth between the two every chapter. It follows their lives and those of the staff and their community over the course of a year. When it begins, The Welcome Home diner has already opened its doors and is struggling to find its place in this tight knit and hesitant neighborhood. The residents are suspicious and guarded and for good reason as Detroit has had many struggles as of late. Addie and Sam were both well drawn characters with interesting histories and plenty of emotional depth, I enjoyed getting to know both of them. There is a large cast of colorful supporting characters as well with often painful, unique pasts that added an extra layer of emotion. This story revolves around food and Lampman’s descriptions were scrumptious. She includes a handful of recipes from the story at the end and I will definitely be trying a few out! Interspersed between the food are some heavy hitting topics such as human trafficking, race relations and gentrification of a community. It’s all handled with grace and a style all of the authors own and leaves much to be discussed, this is an ideal book club read. 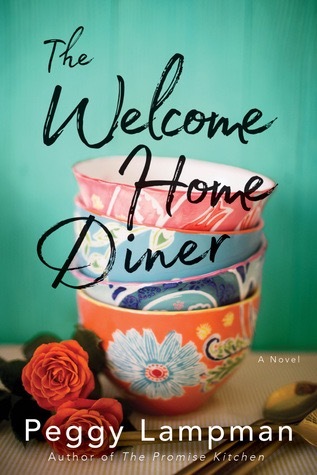 Check out the book, The Welcome Home Diner, by Peggy Lampman, as featured in this review from the Novel Gossip blog. And you’re right, the cover is gorgeous. Oohh I’ll have to check that one out! Oh I love the cover and now I’m off to find this book!